Examiners have raised concerns over the amount of "sickeningly violent" content in students' creative coursework for their English GCSEs. An examiners report from the Edexcel board said one of the most frequently used titles for creative writing coursework was "The Assassin". It comes amid national alarm over a spate of murders and attacks involving young people. The report also questioned high marks given for poor quality work. 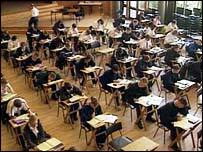 Examiners said some students were producing thinly plotted and extremely violent content in their stories. "The Assassin' again figured frequently as a title," the report said. "This facilitated candidates to write in their own voice but within a very limiting framework, which allowed them to create and maintain a (sometimes sickeningly violent) atmosphere but provided few opportunities for character or plot development. Ian McNeilly, from the National Association for the Teaching of English, said teachers should be concerned by examples of violent writing. "Any teacher presented with a script which manages, in the examiners' words, to maintain a 'sickening' level of violence should be concerned," he said. "We have got enough assassins walking the streets, unfortunately, without giving them time in the classroom," he said. The report also said some teachers were giving their students "incomprehensibly high marks" for "quantity rather than quality". "Some work, which was riddled with spelling, punctuation and grammar mistakes, was awarded incomprehensibly high marks." The report added that schools should also remain aware of the "pervasive issue" of plagiarism. "The evidence of the folders suggests that centres (schools and colleges) take this very seriously and impose whatever controls they can to ensure student work is authentic," the report said.